According to his California death certificate, Charles G. Stevens was born March 3, 1893, in Solomonville, Arizona, to George H. Stevens and second wife Eloisa Michelena of Hispanic heritage. Charles’ grandfather arrived from Massachusetts in the Arizona territory about 1866 and was subsequently employed at various military posts as a guide and interperter. He also served for a time as Indian agent at Camp Grant. About 1870 he married a daughter of White Mountain Apache chief Hashkeedasillaa. Stevens renamed his wife Francesca. 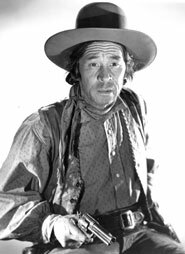 Charles Stevens played Mexicans and Indians or half-breeds (often named Injun Joe, Breed, Jose or Lopez) on screen in a career that spanned 47 years from “The Birth of a Nation” (‘15) to “The Outsider” (‘62). Sources claim Stevens worked for two years with Miller Brothers 101 Ranch Wild West Show in a cowboy sketch before entering pictures. This could also be more Hollywood hype as no written records verify this. Following “Birth of a Nation”, Stevens worked in some 40 silent films including “Empty Hands” (‘24) w/Jack Holt, “Six Shooter Andy” (‘18) w/Tom Mix and “Vanishing American (‘25) w/Richard Dix. During this period, he was befriended by Douglas Fairbanks Sr. and appeared in most of Fairbanks’ films such as “Mark of Zorro” (‘20). Beginning with Paramount’s “The Virginian” in 1929 w/Gary Cooper, the 5' 10½", 150 lb. 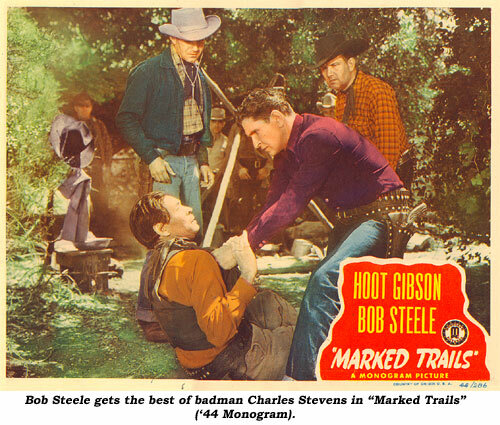 Stevens appeared in some 150 films, dominated by westerns and serials. Many of his myriad parts are uncredited. Some of his best (read most vicious) roles were in Universal serials— “Winners of the West” (‘40), “Overland Mail” (‘42), “Oregon Trail (‘39), “Flaming Frontiers” (‘38) and “Wild West Days” (‘37). His dialogue delivery was slow, calculated and precise. As he got older, Stevens’ face became more weathered and wrinkled making it easy to spot the “crow’s feet” by his eyes when he gave us a squint or quizzical look of concern. 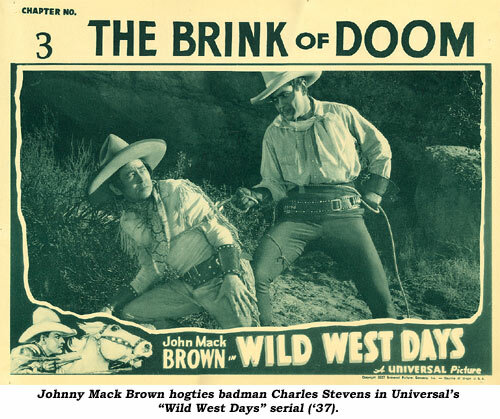 Stevens worked plenty on western TVers as well—“Lone Ranger”, “Kit Carson”, “Range Rider”, “Rin Tin Tin” (on which he once played Geronimo), “Wild Bill Hickok”, “Wagon Train”, “Zorro”, “Jim Bowie” and others, with one of his last being an episode of “Rawhide” in early ‘62, “Incident of the Buffalo Soldiers”. Incidentally, the Charles Stevens listed as a property master in many ‘30s-‘40s films is not “our” Charles Stevens according to research conducted by writer Les Adams. Stevens served in the Armed Forces during WWI and was a noted authority on Indian history and folklore. On August 22, 1964, Stevens died of heart disease at his home at 1926 N. Whitley Ave. in L.A. at age 71. Widowed at the time, he is buried at Valhalla Cemetery in North Hollywood.